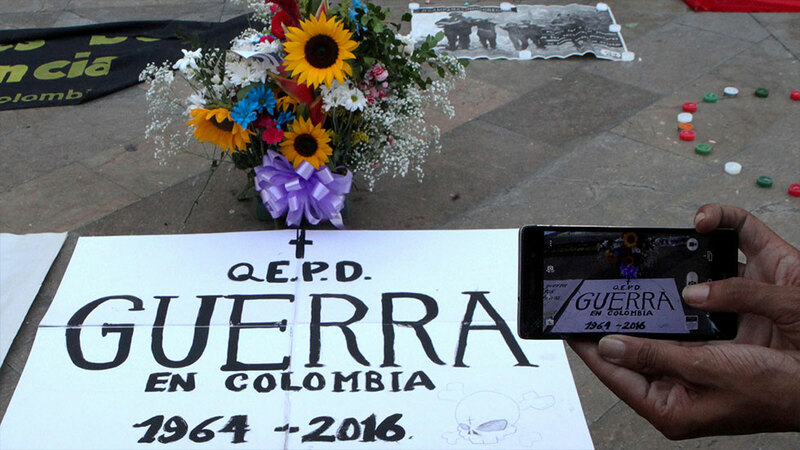 More than half a century of violence between Colombia’s state and FARC rebels officially comes to an end on midnight Monday when a formal ceasefire between the enemies has taken effect. In effect, both parties had already been upholding a ceasefire after agreeing to on June 23, making Monday’s ceasefire mainly a procedural step towards a final peace deal. The FARC’s supreme commander, “Timochenko,” formally declared the FARC’s ceasefire from Havana, where negotiators successfully have been negotiating a peace deal since late 2012. The formal ceasefire will take effect at midnight Monday local time, the same hour a formal ceasefire ordered by President Juan Manuel Santos takes force. While the bilateral ceasefire had in effect already begun on June 23, the presidential and guerrilla orders to definitely end hostilities are historic because it is one of the key procedures leading up to the FARC’s dissolution as an illegal armed force more than 52 years after the group was formed. Santos formally ordered the military to cease fire in a gesture of goodwill towards the guerrilla group after negotiators announced they had successfully concluded peace talks that began in secret in early 2011. With a peace deal informally signed off on and a bilateral ceasefire now in place, Colombia is only a few steps away from ending the armed conflict that cost the lives of more than 265,000 Colombians and displaced millions. The first step is the FARC’s formal dissolution. Between September 13 and September 19, the guerrillas will hold their tenth and final National Guerrilla Conference during which representatives of all guerrilla units will vote on the peace deal. If approved, the FARC will then proceed to dissolve as an armed group at war with the state. Then, the peace deal is formally signed by Santos and Timochenko, formally ending the armed conflict between the state and the FARC. According to Santos, this could happen as soon as on September 23. The signing of the peace deal is called D-Day and immediately will put in motion the FARC’s 180-day demobilization and disarmament process. This will take place in specially designated demobilization zones that will be controlled by the United Nations and Community of Latin American and Caribbean States (CELAC). The Colombian people will have a final say on the deal in a plebiscite on October 2. In the weeks leading up to this vote, Santos and his coalition, the leftist opposition, and a broad range of social organizations will be campaigning for a “Yes” vote. The campaign for the “No” vote is led by former President Alvaro Uribe who — facing multiple accusations of human rights violations and war crimes — has vehemently campaigned against the peace talks since their beginning. While the majority of FARC fighters are expected to be granted amnesty by a special peace tribunal, those who committed grave human rights violations or war crimes will have to appear before court and could face 20 years in prison if they refuse to cooperate. The FARC, the state and thousands of private enterprises are facing many thousands of accusations of war crimes committed during the conflict that has battered the country. The president will be given special powers to implement a number of far-stretching political and rural reforms that seek to tackle the causes and aggravators of the hemisphere’s longest-running armed conflict. The reforms include the FARC’s inclusion to mainstream politics and a wide range of other reforms that seek to reduce chronic political exclusion that have kept political dynasties like that of Santos in power. Apart from the FARC, a small number of illegal armed groups will continue to be active in Colombia whether there is a deal with the FARC or not. On the left, the ELN has been fighting the state since 1964, the same year the FARC was born. The Santos administration has already begun informal peace talks with this group of approximately 2,500 fighters, but has not yet been able to formalize them. At the same time, splinter groups formed from the far-right AUC paramilitary group continue to target labor leaders and rights activists, mainly in collusion with regional elites and fueled by cocaine trafficking. Nevertheless, the demobilization of the AUC between 2003 and 2006 drastically reduced the manpower of these groups. The FARC has so far has shown surprising unity within its ranks, but this has not been absolute. Hundreds of former FARC members could remain in arms and either form new groups or join existing ones, making the end of Colombia’s armed conflict a gradual one.